Walters (Peter Hughes) demands a doubling of his pay or he walks; the job is becoming too dangerous. 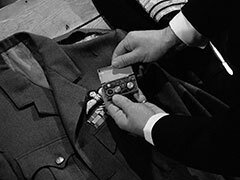 His employer rings for his butler, Benson (John Le Mesurier). The unseen boss takes a silenced revolver from the tray Benson has brought in and shoots Walters; Benson calmly asks if that will be all. Walters is later thrown into the river, his ex-boss revealing a skull ring on his right hand. 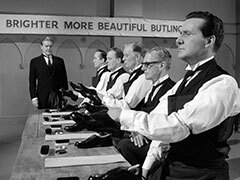 Steed visits a double agent who poses as a barber (David Swift), who tells him someone in the War Office is selling secrets to the other side; he's narrowed it down to three men - Group Captain Miles, Brigadier Goddard or Vice Admiral Willows. His other client grabs a pair of scissors and stabs the barber before he can say more - he's the man who killed Walters - and departs before Steed realises what's happened. Steed visits Willows in a motor launch, disguised with a fine naval beard and posing as Commander Red. Benson is now Willows' butler and lets him in - Willows (Humphrey Lestocq) is too busy attending horse racing meets to talk Admiralty business and complains about Benson, who's a landlubber and doesn't know one uniform from another. He explains that Walters, his previous butler, disappeared suddenly. Steed next visits Goddard in an armoured car, disguised with a neat Army moustache and posing as Major White. 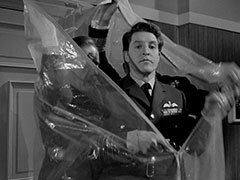 Reeves (Norman Scace) shows him in and fetches the Brigadier but while he's gone the dotty old Major General Goddard (Kynaston Reeves) orders him to take cover and provides Steed 'covering fire' while he crawls across the room. He advises Steed not to print a word about "young Percy" as he's a traitor. Brigadier Goddard (Howard Marion Crawford) appears and orders his father to confine his "manœuvres to the garden. He explains to Steed that his father considers him a traitor as he's the only one in the family who's not in a Cavalry regiment, he can't understand the cavalry no longer exists. Goddard asks the interview be deferred as he has a bad headache and Steed sees himself out - Reeves in on the 'phone, alarmed by who has rung - Steed overhears him arrange to meet the person in the study at 10 pm, and he'll leave the windows unlatched. Steed then visits Group Captain Miles in a helicopter, disguised with a bushy RAF moustache and posing as Squadron Leader Blue. He's met by Squadron Leader Hogg (Leon Sinden) and they have a loud conversation in the peculiar shout that RAF men use, mostly using abbreviations. Steed apologises for letting himself in and Hogg says the wretched butler, Hemming, has disappeared again - Steed raises his eyebrows at another disappearance then learns he's disappeared into the conservatory to trim the roses. 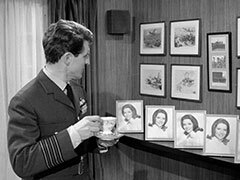 Steed notes a row of photos of girls and discovers Miles is a philanderer; he overhears Hemming (Thorley Walters) take supplies from Sergeant Moran (Ewan Hooper) and chide the Sergeant for gossiping about the OC. Moran says he doesn't have to, it's common knowledge Miles is susceptible to a pretty face. Steed convinces Mrs Peel to see how susceptible Miles is, and explains about his trio of suspects - an admiral who gambles too much, a brigadier who drinks too much and a captain who... well, a captain. Moran asks if they'd like another drink but Steed leaves to be at the 10 pm rendezvous. 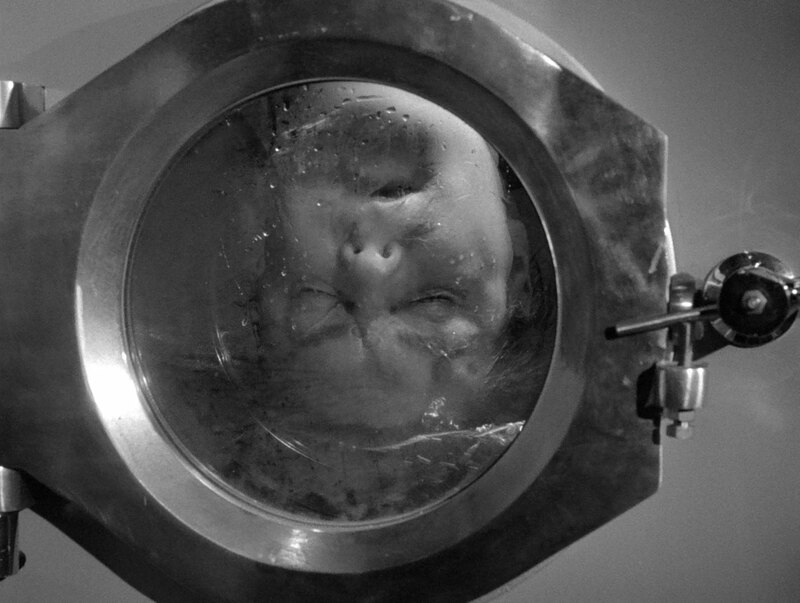 He's too late - Reeves has been killed with a bayonet and the killer attacks Steed with a spiked helmet before making his escape. The commotion brings the Goddards downstairs, the old man playing the Last Post when he sees Reeves. Steed calls Mrs Peel on her car phone - she hasn't contacted Miles yet but tells Steed Operation Fascination has begun. Group Captain Miles (Denis Quilley) enters his office, hung over, and discovers all his photos have been switched to portraits of Emma, and there's another few strewn about the office. He seeks refuge in the bar where Steed is complaining she's not making any progress and - as two female officers approach Miles - the competition is getting stronger. "What competition?" asks Emma and removes her sunglasses. Miles sees her and drops his glass then approaches, smiling. The officers assemble at Miles' house for a meeting of the Committee For Eastern Europe and Miles insists they wait until encased in a large plastic bag before discussing anything. Hemming meanwhile receives a call, ordering him back to the school. When he arrives, Benson shoots him and hides the body in a washing machine. Benson reports to his boss that Hemming is no longer in their way and he knows Steed to be an impostor. Steed arrives shortly after and discovers the uniforms gone, and Hemming's body. Benson appears and leads him away at gunpoint; he reveals he knows Steed's references are fake and suspects him of having been dismissed from service for theft - the best bona fides, as far as Benson is concerned. He orders Steed to replace Hemming in Miles' household. Emma's surprised to see him when she arrives for a date but, after running around Miles' art collection to avoid his advances, she's pleased Steed is there to constantly interrupt them. Emma meanwhile asks Miles outright if he would betray secrets for her and is pleased when he refuses - she tells him he's passed the test and suggests they have a cup of tea. He's relieved when he discovers she doesn't want him to seduce her, "all the others do" and he's tired of it. Miles is called away to Goddard's house for the next conference leaving Steed and Emma to agree that Miles is not the traitor - it's to do with the butler, and Steed has been put there because Hemming couldn't be bribed. He receives a call form Benson, he is to spill wine on Miles' uniform jacket when he returns - and the other two officers receive the same treatment. Benson suddenly appears and takes the jacket then hops into a taxi. 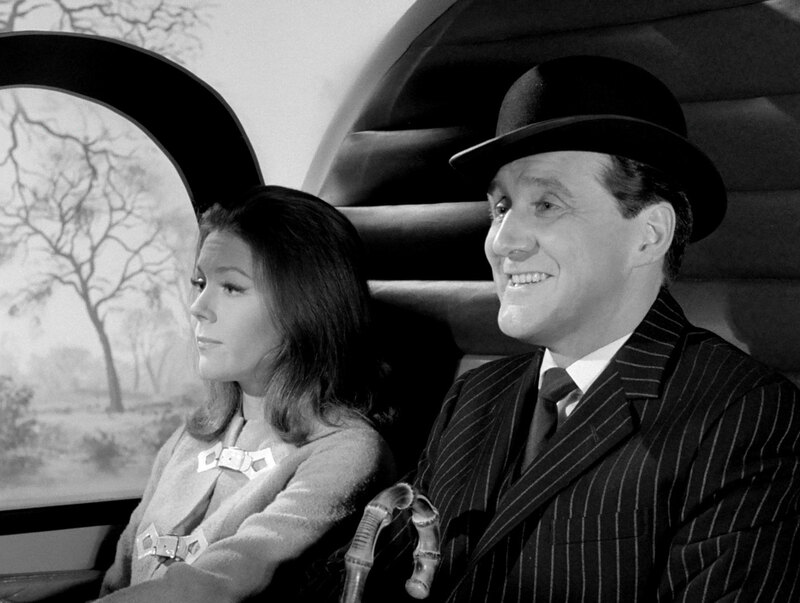 Steed resigns on the spot and leaps in Emma's car to chase after him. Benson cuts open the seam of the shoulder and removes a miniature tape recorder. After he departs with the tape, the Avengers emerge from behind the coats and follow. Benson hands the tape to his boss then hears an alarm as our heroes trip a wire; Emma and Steed are captured and held at gunpoint by Benson. The boss is revealed to be Moran, embittered by being reduced to barman and dishwasher after being a war hero. They about to be led outside and shot when old Major General Goddard swaggers in, waving his cutlass and ordering, "Charge!" Our heroes leap into action, Steed tackling Benson while Mrs Peel chases Moran. Moran decides, to his disadvantage, he doesn't need a gun to kill a woman and is defeated. Steed meanwhile prevails over Benson, despite his serving trolley having retractable knives. Goddard reveals he had superior intelligence - he saw the butler tampering with Percy's uniform. He eyes Emma and says he doesn't like girls on the front line - too distracting - and he offers her his arm. Steed and Emma prepare to depart, and he prattles on about the weather. She looks at him sternly and tells him he's dying to say it. "Say what?" he asks innocently. "Say that in spite of all the suspects -", she replies. 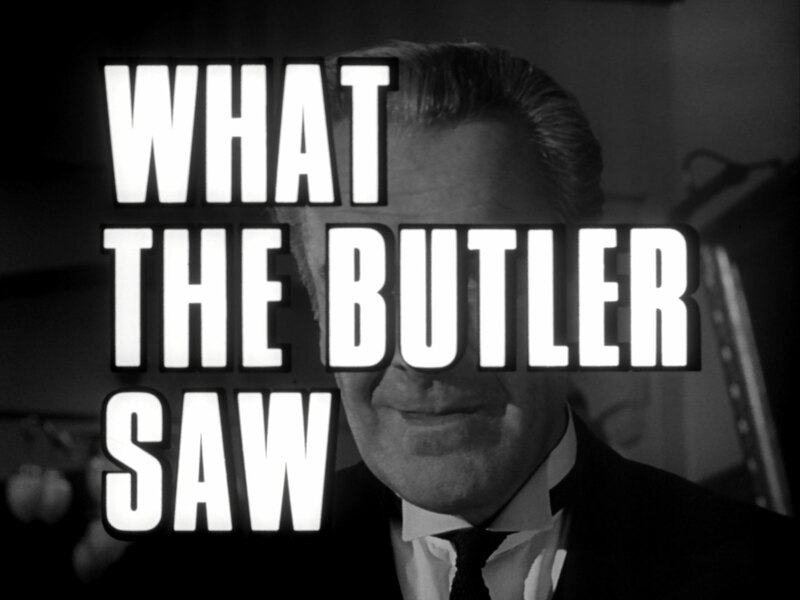 "The butler did it!" Steed triumphantly declares and they take off - with Emma piloting the helicopter.